WORCESTER ­­— This dark, disturbing painting is not, on reflection, dark — it’s very brightly colored — and it’s only disturbing if you want it to be. It’s by Hyman Bloom (1913-2009), one of the most compelling artists to have emerged from Boston in the 20th century, and it hangs in the Worcester Art Museum. 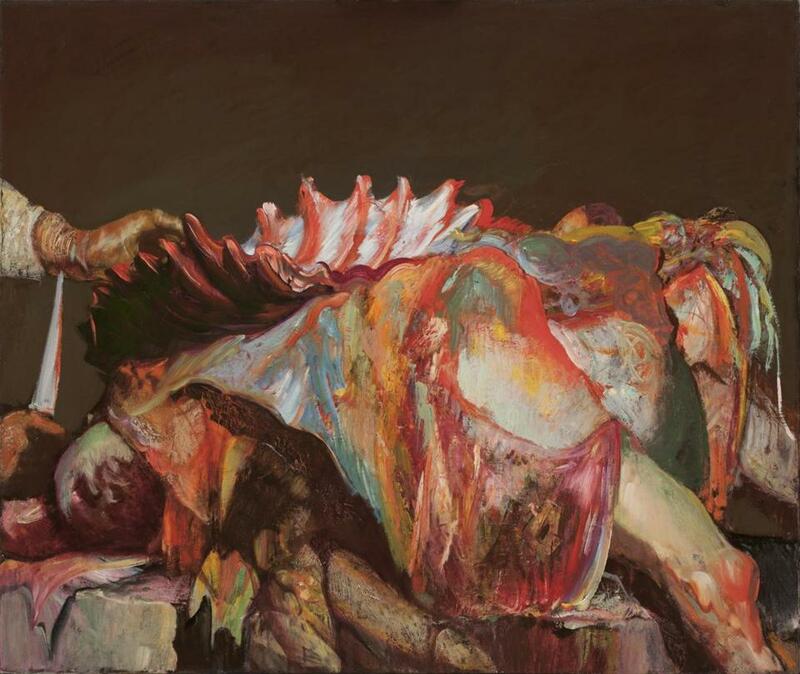 Painted in 1952, it shows a human body with its viscera exposed. We see a knee, an arm, a face, and a rib cage (which also resembles the skeleton of a ship’s hull — hence, one assumes, the title). And then, too, we notice the hands of whoever is performing this grisly operation — an autopsy, most likely. One of them grips a knife, its edge limned by blood. All this points to a real situation, observed and later recalled by the artist. Bloom, a tremendously talented draughtsman, used to visit morgues and saw autopsies being performed in the 1940s and ’50s. In one sense, then, he was continuing a tradition taken up in the Renaissance, when artists were permitted to dissect cadavers in order to learn more about the workings of the human body. Yet, of course, many passages in this picture are in fact very hard to make sense of. And as you peer at them, the suspicion quickly grows on you that this is not just because of your slender grasp of anatomy. It’s because a lot of what is on this canvas is not intended to be descriptive. It is instead about paint. Paint in streaming, iridescent colors — crimson, orange, pink, turquoise, white, purple, and green. The paint is so freely handled, so wristily brushed on, that it has a delirious, almost ecstatic quality. It can make you think of Francis Bacon’s stated wish to paint the human scream in the same way Monet painted water lilies, or of countless other 20th-century conflations of horror and beauty. But Bloom was a one-man movement: All comparisons feel awkward. A Latvian Jew, he came to America when he was 7. As a young man, he became interested in the occult theories of Madame Blavatsky. And when, in 1939, a close friend of his, the artist Elizabeth Chase, committed suicide, and he saw her body in the morgue, the experience affected him profoundly. Part of one shudders to think of a thought like this occurring to a Jewish man, in a morgue, in 1939, on the very cusp of the Holocaust. And indeed, Bloom was surely shaken by what happened over the next six years. Nor, in his art, did he shy from it. But he also pursued his own spiritualist course. He seemed to perceive that it is only at the level of spirituality that death and life can begin to cohere in the human mind, and that what makes them cohere appears to us as beauty.